The WordPress.com stats helpers prepared a 2011 annual report for Citizens for Space Based Solar Power. Thanks to everyone who visited this year and here’s to a great 2012 for all! A San Francisco cable car holds 60 people. This blog was viewed about 3,500 times in 2011. If it were a cable car, it would take about 58 trips to carry that many people. The full text of the 242-page report can be accessed here. The following is a 41-minute presentation from the International Space Solar Power Symposium at the National Space Society 2011 International Space Development Conference (ISDC) of a draft report of the study, Space Solar Power: The First International Assessment of Opportunities, Issues, and Potential Pathways Forward by John C. Mankins (Artemis Innovation). Mankins is the Chair and Editor of the study. It’s time to say goodbye to the original Andreas09 theme, below, and say hello to the fresh new Twenty Eleven theme. I hope this cosmetic update makes new posts and the overall site easier to read and makes it easier to get the word out about space-based solar power and all of the possibilities it represents. NASA’s new overarching goal should be to lead the joint public-private development and deployment of space-based solar power as a baseload power source. It’s a goal that would encompass many other technologies (non-rocket launch methods, AI-based robotic assembly in space, mining of lunar and NEO resources, lunar base operations, energy conversion and transmission methods, etc.) and inspire young people get advanced educations and be a part of making the planet a better place for everyone, much like the Apollo program did. The unique aspect of NASA adopting space-based solar power as an overarching goal is that the long-term result would be a revenue positive system owned and operated by the United States of America. We would become a net exporter of clean, virtually unlimited energy. Prohibitive launch costs are cited as the primary roadblock to space-based solar power today. Let’s come up with an elegant solution, such as a mass driver launch system initially powered by terrestrial solar power and eventually powered by the first space-based solar power satellite. It’s a positive upward spiral. The more power available, the more payload put in orbit and assembled into additional satellites resulting in more power available … and repeat. Once such a self-proliferating system harvests more energy than it uses, the excess energy can be directed into existing or new distribution grids. New Solar Energy Conversion Process? Author Rob MahanPosted on August 27, 2010 August 27, 2010 Categories commercialization, energy conversionLeave a comment on New Solar Energy Conversion Process? While this video from Jon Stewart’s The Daily Show is satirizing the government rhetoric regarding the need for an energy-independent America, it points out a sad trend. For generations, our politicians have paid the topic of energy independence lip service when it has been politically expedient but have done little of any substance to advance towards achieving this critical national goal. As an Opportunity for Strategic Security – Phase 0 Interim Assessment Study“, Citizens for Space Based Solar Power has received over 10,000 visits. I hope this milestone is an indication that more and more citizens are becoming aware of space-based solar power and that we as the United States of America are moving closer to launching a major, multi-generational effort to develop and deploy this game-changing and necessary technology. Please sign Citizens for Space Based Solar Power's petition "USA Must Lead the Transition to Space-Based Energy" on change.org. D3 SSP Team: "We propose the United States begin a program in Space-Based Solar Power ... and take leadership—in space, on energy, on climate change." The contents of c-sbsp.org are not affiliated with any of the individuals, sites or organizations linked to or referenced and they represent the opinions of the site operator, an individual and private citizen. While not responsible for contents of comments made by other individuals, the site operator reserves the right to remove any comments which are deemed inappropriate for the site. Constructive comments, positive or negative, are always welcome. 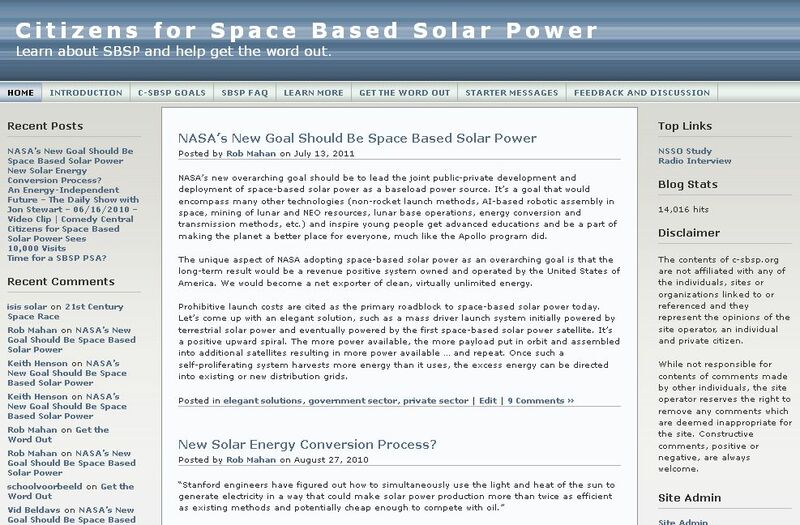 Citizens for Space Based Solar Power Create a free website or blog at WordPress.com.